Bribing of voters is rife in Swaziland as the kingdom gears up for the first round of the discredited national election. Cash, food and alcohol have been distributed and even prisoners in jail have been given money during the camapign. 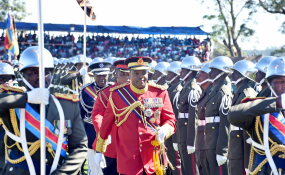 Newspapers in Swaziland (the kingdom recently renamed Eswatini by its absolute monarch King Mswati III) have reported extensively on bribery throughout the registration, nomination and primary election stages. People go to the polls on Saturday (25 August 2018) for the primary election with final voting due on 21 September. People convicted of bribery at election time in Swaziland face fines of E10,000 or two years in prison. Political parties are banned from taking part in the election and candidates must stand as individuals. Elections in Swaziland are widely regarded as not democratic by observers outside the kingdom. The King choses the Prime Minister and government ministers and the parliament has no powers as these rest with the King. Bribery is taking many forms. At Maphungwane in the Matsanjeni North Constituency football teams rejected a E10,000 (US$790) sponsorship from an aspiring member of parliament. The Swazi Observer reported (18 May 2018) that the sponsorship was in the form of prize money that would be paid at the end of the football season and after the election had been held. The newspaper reported the clubs' representatives questioned the timing of the sponsorship and rejected the offer. One club boss told the newspaper that aspiring MPs had also tried to manipulate them in the past. The Swazi Observer reported (21 May 2018) A former government minister was accused of bribing people with promises of food parcels for their votes. It did not name the man but said he and his brother had been offering free meals and transporting people to registration points in the Hhohho region. People had made verbal agreements to vote for the ex-minister when the election proper began. The newspaper reported that police, acting on a tip off, detained and recorded statements from 17 people. Poverty-stricken textile workers said they sold their votes for cash and chicken pieces. The Swazi Observer reported (27 May 2018) sitting members of parliament had sent their agents into factories to buy up votes in the industrial town of Matsapha. People said they were persuaded to register as residents of the surrounding areas as opposed to their chiefdoms of origin. Other textile workers in Nhlangano said groups of 50 or 60 of them had been given free lunches by sponsors of people keen to win seats in parliament. They also said transport costs to and from work had been paid. The Swazi Observer reported (15 June 2018) that some outgoing MPs were involved. More recently, The Times of Swaziland (10 August 2018) reported, A crowd of elated textile workers at Fashion International in Matsapha Industrial Site, 'danced outside their factory while waving E50 notes that had been allegedly given to them by an aspiring MP' from one of the constituencies in the Manzini Region. The newspaper reported the money was distributed by the candidate's campaign managers who were also employed in the factory. It said 250 workers were given at least E250 each. The Sunday Observer (19 August 2018) reported that prisoners were being paid by aspiring candidates to 'grease the palm' of potential voters. It also reported a series of cases of voter bribery. 'In Siphofaneni, an aspiring MP was captured giving out bread and sodas to members of his constituency this past week. He is said to have encouraged members of the public to vote for him if they want to continue getting the parcels. 'Another aspiring MP is reported to be allegedly giving out chicken portions in Matsapha to textile employees from his parked vehicle while his contenders are giving out sums of money. 'In Manzini, another is reportedly giving out a minimum of E50 notes to registered voters who sing his praises as soon as he appears. In Swaziland, people are only allowed to vote for 59 members of the House of Assembly, the King appoints a further 10. No members of the 30-strong Swaziland Senate are elected by the people.